Random Thoughts: How does your garden grow? It warms my heart each time you speak of your father Merry.I am getting ever closer to that day when I will be caring for my mom. Love the planters,and it is a wonderful way to do it! I am sure all will grow fantastically.I also like that you share the photos,it puts me there wandering your yard.Have a wonderful evening Merry. Oh, I love my little garden: 4 tomato plants, dill, parsley, oregano, cilantro, chives, marigolds. And two pepper plants I'm mulling over putting next to the mailbox. And thanks for the art event encouragement! Yikes. 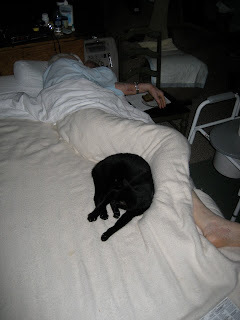 ''My Father is recovering from surgery, has a black cat (Blackie). Also starting to move around.